The realisation that the great diversity of the world stems from a handful of elementary particles acting under the influence of a few fundamental forces was one of the triumphs of twentieth century physics. But the path to this realisation was not straightforward, and at one point physicists were faced with a bewildering collection of "fundamental particles" — more than there are elements in the chemical table! It has taken an understanding of mathematical symmetry combined with experiments into conditions similar to those soon after the "Big Bang" to bring physicists to the elegant understanding of today. In the early 1930s the entire Universe appeared to have been built using only three elementary building blocks: the protons and the neutrons which were the constituents of nuclei, and the electrons which complete the atoms. The electrons were bound into the atoms by electromagnetism, since they were attracted by the opposite charge of the nuclear protons, but in order to ensure that the nuclei did not disintegrate because of the mutual repulsion of their constituent protons, a new short-range force, the strong interaction, was required. This simple picture did not last long. Antiparticles, which had some properties (such as mass) equal and others (such as charge) opposite to normal particles, were predicted and later discovered. Experiments on radioactive beta decay, where one element spontaneously converts into another with the emission of an electron, appeared to violate the laws of conservation of energy and momentum. To conserve these quantities it was postulated that an additional particle, named the neutrino, was emitted, which carried away the missing energy and momentum. The neutrino did not feel either the electromagnetic or the strong force, and hence escaped undetected in these beta decay experiments. It would be created by another new short-range force, the weak interaction. This force also allowed neutrinos to interact with other objects such as nuclei, but was so feeble that neutrinos would on average have to travel through light years of iron before interacting; they were therefore thought to be undetectable. However, in the 1950s the huge flux of neutrinos coming from radioactive material in nuclear reactors led to their detection. Since then neutrinos from various sources — accelerators, reactors, the Sun, supernova SN1987A, cosmic ray interactions — have been observed in many experiments. Also in the 1950s and 1960s, experiments using cosmic rays, and later the new accelerators, showed that if particles such as protons hit nuclei with sufficient energy, then additional new particles could be created by converting some of the collision energy into particle mass, (according to the well-known equation E=mc2). These particles were unstable and decayed rapidly into more stable forms, either in around 10-23 seconds through the strong interaction (which can also cause decay), or at a more leisurely pace, say in 10-8 seconds or 10-10 seconds through the weak interaction. By the 1970s the number of so-called "elementary particles" exceeded the number of chemical elements! Fortunately the present situation is again much simpler. There now appear to be only two classes of elementary building blocks, called quarks and leptons. Quarks feel the strong interaction, leptons do not. In our normal surroundings where kinetic energies per particle are low, we have only two of each. Electrons and neutrinos are leptons. However, the proton and neutron are no longer elementary, but are made up of two types or flavours of quark called up (u) and down (d). Each contains three quarks: the proton is made up of two up and one down; the neutron of one up and two down. The electric charges are +2/3 for up and -1/3 for down (relative to the electron charge of -1), so, as we would expect, the neutron has no charge, and the proton a positive charge of 1. When particles collide at higher energies, which occur in cosmic ray or accelerator interactions, the simple pattern of two leptons and two quarks is repeated, but only twice, leading to three generations of quarks and leptons, as shown in the diagram below. Also, every quark and lepton has an antiparticle, so we end up with six each of quarks, antiquarks, leptons and anti leptons. Quarks and antiquarks combine together to form composite particles called hadrons, which come in three classes: baryons which contain three quarks, anti baryons which contain three antiquarks, and mesons which contain one quark and one antiquark. There is some evidence for more complex hadrons, which would be like hadronic molecules. Quarks have an additional attribute called colour. They are labelled red, blue and green; antiquarks have the corresponding anti-colours. These have nothing to do with visual perception, but the labelling is useful because all hadrons are colourless, in the same way that white light can be generated on your TV or computer screen by the admixture of red, blue and green pixels. Baryons contain one red, one blue and one green quark, mesons contain one quark of any colour and the other quark of the corresponding anti-colour. We expect all particles to feel the gravitational force, which is, however, fantastically weak in comparison with the others. For example, the electromagnetic force between a proton and an electron is 1040 times stronger than the gravitational force. All particles feel the weak force. Quarks and charged leptons also feel the electromagnetic force, and quarks feel the strong force. The forces through which the building block particles interact are transmitted by the exchange of another type of object. The force-carriers are bosons. The carrier of electromagnetism is the photon. Gravity is believed to be transmitted by particles called gravitons, but these have not yet been detected. The objects which carry the strong force between quarks and hence glue them into hadrons are called gluons. Unlike photons, gluons can interact with each other. As a consequence of this, the force increases with distance, and quarks are confined inside hadrons, so that free individual quarks have not been observed. Gluons were first discovered in 1979 at the DESY laboratory in Germany. The theory of strong interactions, the interaction of coloured quarks and gluons known as quantum chromodynamics (QCD), is well-developed and consistent with experiments, although it is not easy to test it precisely (see here to find out more). Initially it was thought that a charged carrier, called W for weak, was responsible for the weak force. But in the 1960s, theorists achieved the surprising feat of unifying the electromagnetic and weak forces into a single mathematical framework. The two forces do appear very different to us: electromagnetism has infinite range, while the weak interaction (at energies available at that time) is very feeble and confined to sub-nuclear distances. Yet, the two forces can be seen as two aspects of a more fundamental electroweak force, with the unification only becoming apparent at very high energies. In electroweak theory, there are four mediating objects. The massless photon transmits the electromagnetic force and the weak force is transmitted by three massive particles: the charged W+ and W- particles and the neutral Z0 particle, which have masses about 100 times that of the proton. The intrinsic strengths of these carriers are identical, but the massive nature of the W and Z0 particles limits their range to very short distances (a consequence of the uncertainty principle of quantum mechanics). In collisions at relatively low energies, the particles do not approach each other sufficiently closely for the weak interaction to be significant compared to the electromagnetic force. However, at very high energies, say 100 time the proton rest mass, close encounters are common, showing electroweak unification. The most spectacular experimental verification of this theory was the discovery of the W and Z particles at CERN in 1983. Electroweak theory has now been tested to high accuracy. Symmetries play a significant role in particle physics. By symmetry we mean immunity to change: features of a theory and the natural processes it describes remain the same even when you change a particular aspect. For example, a ball thrown up in the air will be subject to the same laws of physics, whether you throw it up in London or New York. Similarly, in mechanics, in electromagnetism, and in strong interaction physics, there is no intrinsic difference between left and right. A process and its mirror image occur at the same rate. Observable processes would occur with the same probabilities if all particles were changed into their corresponding antiparticles. At the microscopic level, the laws for a process and its time-reversed process should also be equivalent. For macroscopic systems, time reversal does not hold, but this is a consequence of its statistical improbability rather than of basic laws. In the 1950s it was found that for weak interactions the first two of these symmetries — the left-right and the charge symmetries — do not hold. In fact, they are as wrong as possible! The strict mirror image of beta decay is not observed unless at the same time particles and antiparticles are interchanged. This gives rise to a combined symmetry (called CP), but even this is violated in some rare processes. This violation is not understood, but is believed to an essential condition for the vast preponderance of matter over antimatter in our Universe. Electroweak theory and QCD, the theory which describes the strong force, have been incorporated into what is known as the standard model of particle physics. Initial theories required all particles to be massless, which presented a problem since quarks, leptons, and W and Z particles do have mass. A mechanism explaining how those particles acquire their mass was postulated in 1964 by three groups of theorists: Robert Brout and François Englert; Peter Higgs; and Gerald Guralnik, Carl Hagen and Tom Kibble. They suggested an all-pervading field, now known as the Higgs field. Objects which did not interact with the field would travel unimpeded at the velocity of light. These would be the photons, which have zero rest mass. Others would be impeded by various amounts making them travel more slowly, hence acquiring different masses. The carrier object of this field is the Higgs boson. The above six physicists were awarded the Sakurai Prize in 2010. 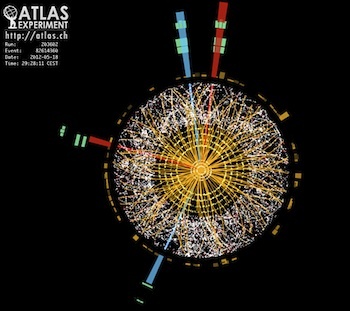 It was triumph for physics that the Higgs boson was discovered in 2012 by two large international collaborations (called ATLAS and CMS) at the CERN Large Hadron Collider (LHC). The mass of the Higgs boson was 125 GeV/c2. Englert and Higgs were awarded the 2013 Nobel Prize for physics (Brout had died, and the Nobel cannot be shared by more than 3 people). The LHC collided counter-rotating protons with energies of up to 4 GeV per beam (i.e. 8 GeV in the collision centre of mass, CM), and has produced many other results. It was shut down for a couple of years for improvements, and should start up in Summer 2015 with an increased CM energy of 13 GeV. While the standard model has proved a big success in many ways, there are still questions it doesn't answer. You can find out more about these in the second part of this article. 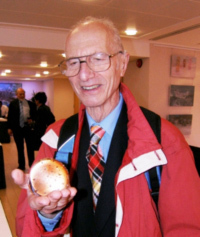 Peter Kalmus, Emeritus Professor of Physics at Queen Mary University of London, has carried out research in experimental particle physics at accelerators in several countries, and is the author of about 120 publications. He was awarded the Rutherford Medal for the discovery of the W and Z particles, the Kelvin Medal for public understanding of science, and an OBE for services to physics. I'm no high energy physicist, but I think the units for the LHC collision energy are Tev and not Gev. 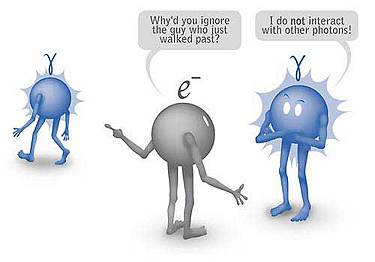 Photons do interact with each other.